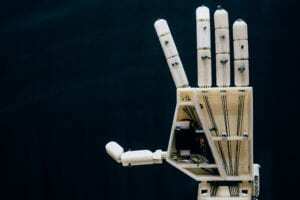 While robots are being taught all sorts of crazy skills to help humans, graduate students at the University at Antwerp in Belgium have designed a robotic arm that can perform sign language. The students wanted to address the needs of deaf and hearing impaired people who may not have interpreters with them at all times. The robotic arm and hand were created using 3D printing, with 25 3D-printed parts. Using a special glove, the arm is taught the gestures for sign language letters and numbers. Currently, the hand works independently, so it can only perform one-handed gestures but the team is at work to create develop another arm so that they can work together for two-handed gestures. The goal of having a robot interpreter would not be to replace humans, but to aid in places where people may need sign language services. Having a physical object instead of a screen or an app makes it easier to interact in the real world. The robotic arm could also be used as a teaching device to repeatedly demonstrate signs to students.